While there’s still a spring chill in the air here in San Francisco, the transition to summer is palpable at the Ferry Plaza Farmers Market. Zuckerman’s asparagus makes its final appearance this week, spring peas wind down, and green garlic is giving way to maturing bulbs. 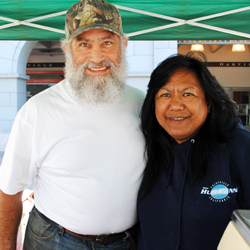 According to Dexter Carmichael, CUESA’s director of operations for the Ferry Plaza Farmers Market, early June offers a brief lull before the tidal wave of summer produce that was planted in March makes its way to the farm stands. Newcomers such as berries and stone fruit from the Central Valley herald warmer days ahead. As we turn the corner into summer, farms at higher (and thus cooler) elevations, such as Sierra Cascade Blueberry Farm, will start bringing their crops to market. By the end of June, we should start to see summer gems like boysenberries (which have gotten off to a slow start this season), figs, and even some hot-house melons. The market plaza will be at full capacity, brimming with summer’s bounty. What do we have to look forward to this season? Based on his daily conversations with farmers, Dexter forecasts an excellent harvest of nuts and early stone fruit, which are developing nicely after a substantial spring bloom. “Cherries and apricots should be especially good crops this year,” he says. Brooks and Rainier cherries are already popping up, and Bings will soon be on their way. 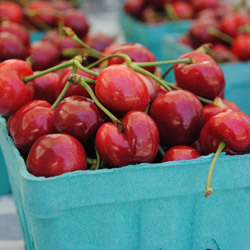 In a couple weeks, Lagier Ranches will have limited amounts of sour cherries, a rare and special treat at the farmers market. While it still feels a bit early for peaches and nectarines, we’ve already seen some some superb May varieties at the market. As for apricots, Dexter predicts that this could be the best season in five years. These late spring favorites have just started showing up in the stands, including Everything Under the Sun’s Blenheims (sometimes called Royals or Royal Blenheims), an intensely-flavored variety that, due to its delicate nature, small size, and deceiving unripe appearance, rarely appears in supermarkets. The Blenheim has been chosen for Slow Food USA’s Ark of Taste as an endangered food variety worth preserving. CandyCot Fruit Company, known for its super-sweet apricots, should return by the end of June. Tory Torosian of Tory Farms, located in Dinuba near Kings Canyon National Park, lost many of his peaches and nectarines to brown rot in 2011, but he’s optimistic about this season’s harvest. A recent heat wave has sent him and his crew rushing to pick the fruits off the trees before they overripen. “Everything looks good now,” he says, “but it always takes the first couple of picks to get a feel for the season.” He is less confident that his later-season trees will be as prolific. “Last year the plums and pluots saved us, but this year they’re looking light,” he observes. Dexter says that many of the other farmers he’s talked to have echoed predictions that early stone fruit season will be strong, but they’re less sure about the second wave of harvests. Salad lovers are eagerly anticipating the return of nightshades like cucumbers and tomatoes. Most of the ones you see at the market right now are grown in hot houses, but field-grown cucumbers are starting to come out of Southern California farms and, as we move into July, field-grown tomatoes will be abundant, with cherry varieties leading the way. You can also expect to see Little Organic Farm’s dry-farmed new potatoes in a couple weeks. Baby summer squash is already underway, and the return of Green Gulch Farm always signals an explosion of lettuce and other greens, boosted by a healthy dose of sunshine from longer days. Look forward to wax beans toward the end of the month, and, just in time for summer grilling season, G&S Farms will be back at the market with their famous Brentwood-grown sweet corn next Saturday. You can also see summer taking hold in the types of flowers at the market. White Crane Springs Ranch has had some huge peonies the last couple weeks, and Allstar Organics now has small bunches of heirloom roses. Dahlias, cosmos, and Sweet Williams are starting to bloom at Thomas Farm, and there are plenty of sunflowers and lavender to come.